Different calendars have different purposes, but printing off each calendar separately is both tiresome and leaves you with more paper to keep track of. Condensing your calendars into one gives you many advantages, such as avoiding going back and forth between them and being able to print all your appointments in one go. The best part is that it’s very easy to do. 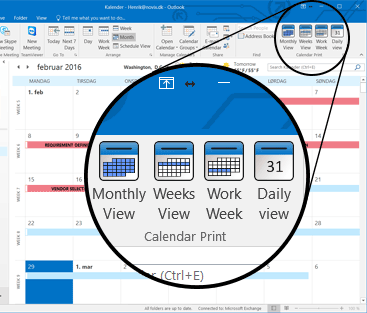 There’s no need to re-enter all your appointments, events and so forth manually in your Outlook calendar to prepare it for printing. With a few clicks and some know-how, you can either import your Google appointments to Outlook or subscribe to your Google calendar. Both options offer different benefits, and which one you choose will depend on your reasons for wanting to view your Google appointments in Outlook as well as your willingness to change your calendars in this way..
Log into your Google account, and select Calendar. 2. When you are viewing your calendar, look to the left side of the screen. Select My calendars > Settings. 3. In the new window, select Export calendars. 4. Depending on your browser and its settings, you may be prompted to select where to save the zip file to—make sure to choose a place that’s easy to find again! Files and folders can seem to have a life of their own and hide sometimes. If you are not prompted, the file will likely be in your Downloads folder. 5. Navigate to the location of your newly downloaded zip file. Right click on it and select Extract All. 6. The extracted file will have an ICS (iCalendar) file for each of your Google calendars. Make sure the one you want is in there—if it is not, you may have been logged into the wrong Google account. This can happen if, for example, you have multiple email addresses or multiple users on one computer. The screenshot below is what your extracted file will look like. You’ve exported your Google calendar—now it’s time to import it into Outlook and simplify your calendar management. 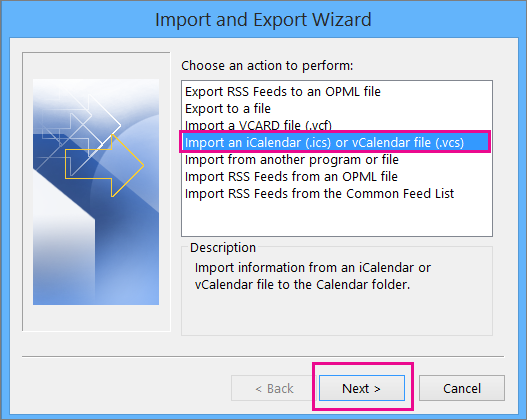 Bear in mind that if you want to import multiple calendars (iCalendar files) into Outlook, you will need to repeat the following steps for each calendar. Good thing they are easy and quick to do! Open Outlook on your desktop and log into your account. Navigate to your calendar. Select File > Open & Export > Import/Export. The wizard below appears, and the magic can begin! 3. Viewing the wizard, highlight Import an iCalendar (.ics) or vCalendar file (.vcs). Then click Next. 4. Navigate to the location of the file you extracted earlier, and select the one that ends with gmail.com. When you’ve done this, a new window appears. 5. In the new window, select Import. 6. Your appointments and events from Google should now be visible in your Outlook calendar. Go check it out! Exporting and importing your Google calendar lets you add the contents of that calendar at a given time to Outlook. Subscribing to it, however, will keep Outlook up to date on new appointments and events in your Google calendar. Log into your Google account and navigate to your calendar. 2. Look at the left side of the window—you will see a line saying My calendars. Click it to expand it. 3. Choose the calendar you would like to subscribe to in Outlook, and click the arrow next to it. In the menu, choose Calendar settings. 4. Look for the section named Private Address, and click ICAL. 5. In the new window, right click the web address and select Copy shortcut from the menu. Do not click the link, as that will cause your calendar to open as a Calendar Snapshot in Outlook which will not be updated. 6. Open Outlook, and go to your calendar. 7. Select File > Account Settings > Account Settings. 8. Find the Internet Calendars tab, and click New. Your Google calendar has been imported or subscribed to, and now all your appointments and events seem jumbled together. 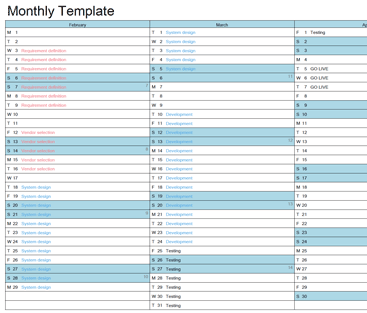 A good way of sorting them is to use color categories to easily identify different types of appointments. 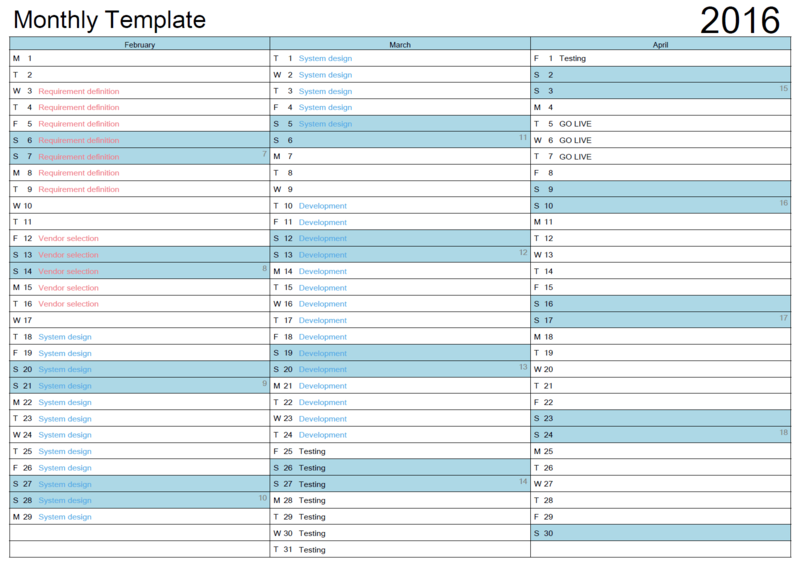 Once that’s done, your combined calendar is ready for printing! 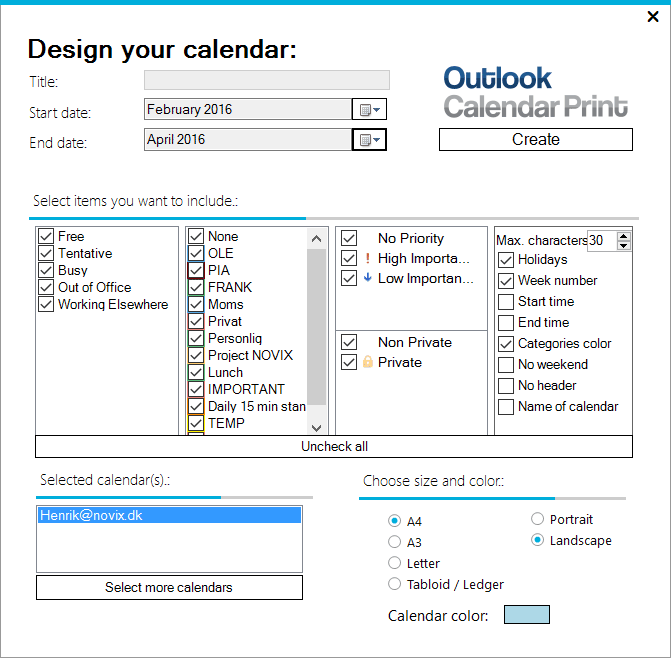 Now when you have all your Google calendar appointments in Outlook, you can print them with Outlook Calendar Print. 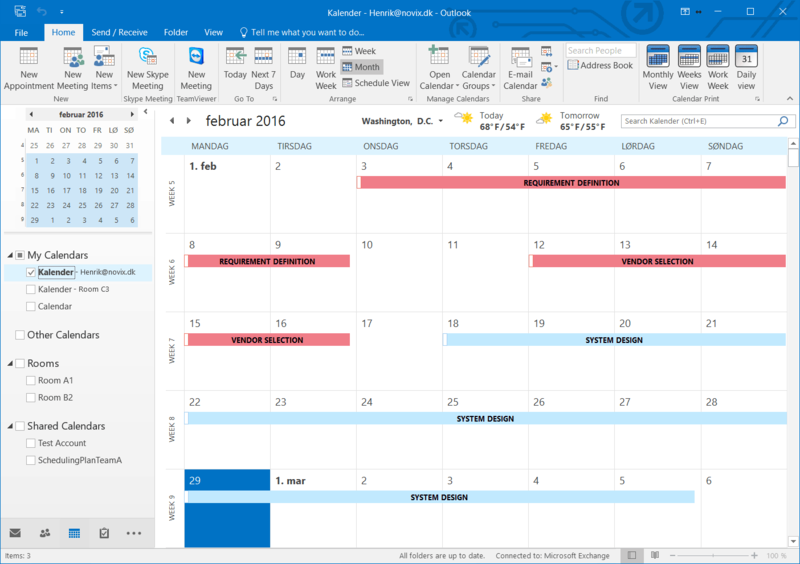 In the past you could use Calendar Printing Assistant from Microsoft, but it is not fully compatible with Outlook 2013 & Outlook 2016 and if you are running 64bit version of Outlook it will not work.